La physique quantique, tree branch and post-consumer waste, 56 x 46 x 36 cm. In the far left corner of the gallery, a small boxed sculpture stands on its plinth. Inside the box, a twisted figure is tied to an upright post. Overhead, the crossing bar appears as a thin, curving line. Seen from a distance, “La Physique Quantique,” 2018, might be a crucifixion. Walk closer. This is no detail from a contemporary reinterpretation of the Isenheim altarpiece. In this work, artist Jennifer Anne Norman gives us a story of transformation, but it is a newer story. The ending is unknown, uncertain, and likely not good. 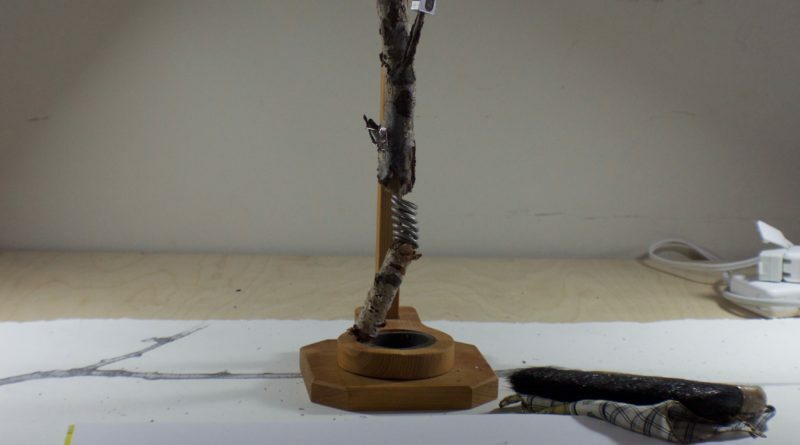 The crumpled figure tied to the post of “La Physique Quantique” was formed from a broken, twisted twig, festooned with a small pencil sharpener, straight pin, and metal bolt. The figure stands atop a coiled metal spring. Red and green rubber bindings tie the figure to its post, a finished stick of pine. One binding is labelled “Canada.” Attached to all is a blue National Gallery of Canada gift shop tag, minus price. Walking around the sculpture multiplies one’s understanding of the artist’s work. Change the point of view, and the crossing bar might be the line of a distant horizon. Lines of decay? Could be flights of birds against a skyline. But still, there is that crumpled figure tied to the stake inside the box. What is its meaning? Is this what happens to the castoff, to human waste? Does offal ever decay? Go away? There are four sculptures in the exhibition (at the Karsh-Masson Gallery in Ottawa, from April 26 to July 4, 2018), 11 framed drawings, and one large unframed paper hanging. Ten of the drawings are studies of “Reclaim,” 2017, a dramatic sculpture suspended from the roof of the artist’s workshed last year in the Haliburton Highlands. The artist documented how that work came to be in a photographic essay published as Reclaim (2017). Visitors are provided a copy of the book in the gallery. At first sight, the sculpture “Reclaim” appears to be a tree. But that was long ago. Today it is a clumsy memorial. 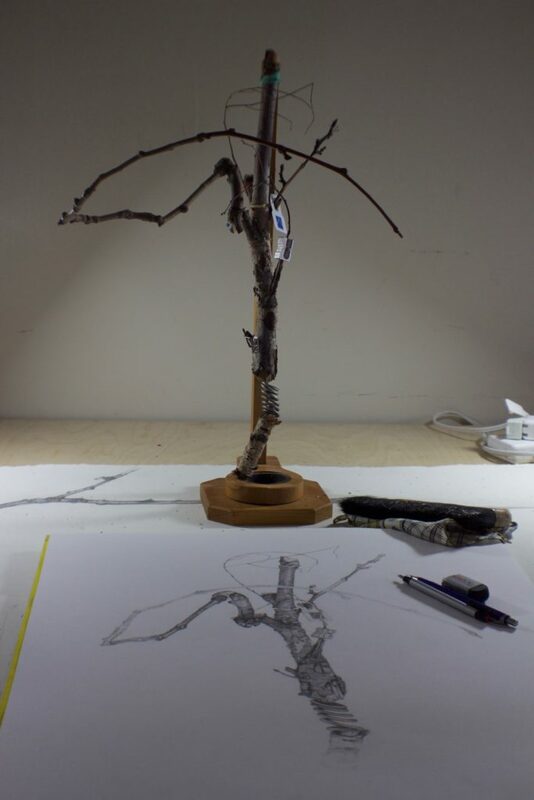 The branches are all prosthetics, twigs attached and mended with tape and bolts. The artist found all of the materials for the sculpture in a trash heap – the landfill of the wondrously named Municipality of Dysart et al. At the gallery’s entrance, the exterior display window has been filled with streamers of strung-together plastic cup lids. Entitled “Sunset Park,” 2016, the streamers fall over the display plinth and are also seen inside the gallery. No need to ask if these coffee cup lids were all collected one by one from a park somewhere. We know the answer. Jennifer Anne Norman’s exhibition “Forest for the trees” reminds us of that old cautionary piece of wisdom: “missing the forest for the trees,” becoming lost in details, losing sight of the whole. Take another look. This work matters much. The artist has done her part well.